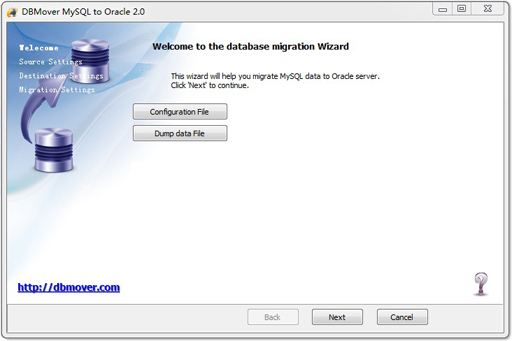 Dbmover for Mysql to Oracle is a powerful tool to import MySQL contents into Oracle database. DBMover allows you to define flexible table/field mappings between MySQL and Oracle databases. DBmover for Mysql to Oracle also lets you perform a query and use the query result as a data source during migration. Dbmover for Mysql to Oracle allows to automate and schedule the conversion process. Direct connection to Oracle and MySQL databases without additional settings. Ability to save settings into profile. Automatic data migration at the time and period you specify. Ability to import SQL queries into Oracle. Ability to export MySQL data into dump file. Ability to establish flexible mappings between source and destination tables. Robust error-handling mechanism recording every possible error without any user interaction. Fully optimized performance resulting in quicker manipulation of large amounts of data. GUI-based utility for Oracle management. Java FREE, fast and efficient! MSSQL-to-Oracle is a program to move MS SQL databases to Oracle server. Qweas is providing links to DBmover for Mysql to Oracle 2.0.1 as a courtesy, and makes no representations regarding DBmover for Mysql to Oracle or any other applications or any information related thereto. Any questions, complaints or claims regarding this application DBmover for Mysql to Oracle 2.0.1 must be directed to the appropriate software vendor. You may click the publisher link of DBmover for Mysql to Oracle on the top of this page to get more details about the vendor.